There's not much to really pull from that video besides it looks chilly. I will say that my first time watching it I had overlooked that on the 1:41 mark Darren Grainger takes a quick drop and heaves it (by my count) 47 yards directly into the arms of his sprinting receiver. Grainger has, by many reports, a big arm. If teams start cheating up to slow down Furman's running game and he can take two steps and throw it 50 yards on target, that's going to give defensive coordinators some sleepless nights. 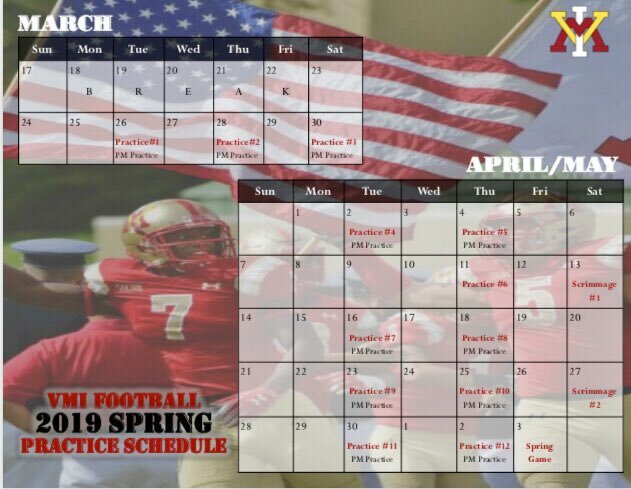 Ayantee's Spring Practice begins March 11th; the Monday after spring break and Mardi Gras. Apparently at Troy High because they're having community involvement events, plus a noon lacrosse game at our football stadium. Robert Riddle got off to a great start in 2018, but a injury against The Citadel cost him the rest of the season. He is now cleared to start practicing again, and he couldn't wait to get back on the field. Robert being back on the field is a good sign for all Mercer fans, and even better for his head coach. "I'm very pleased with where he's at and he was a great leader out there for us today," said Bobby Lamb. "When the ball comes out of his hand its just different from the other guys. He's a special player and we need to find ways to keep him healthy." Riddle will have a new offensive coordinator in Bill Legg this year, and he's already gained a wealth knowledge in just a short amount of time. "He brings a lot of knowledge from Marshall and Mississippi State and I'm just trying to be the best QB that I can be." Maine announced their spring practice schedule this past Saturday. 15th annual Jeff Cole Spring Game set for Friday, April 26 at 7 p.m.
Orono, Maine -- The University of Maine football team will begin its spring practice slate on Tuesday, March 26. 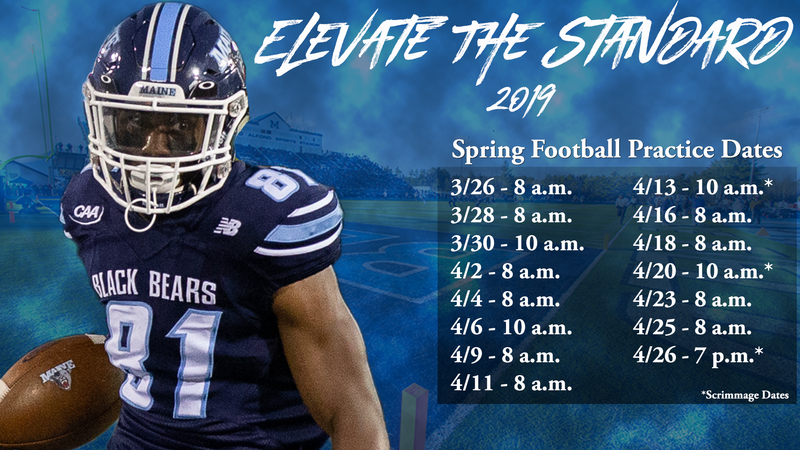 The Black Bears will hold 15 practices, including three scrimmages, concluding with the Jeff Cole Memorial Spring Game on Friday, April 26 at 7 p.m. at Alfond Stadium. Highlighting the spring slate will be Maine's three spring scrimmages. The Black Bears' first two scrimmages of the session will be held on Saturday, April 13 and Saturday, April 20. The 15th annual Jeff Cole Memorial Spring Game will be held on Friday, April 26 at 7 p.m.
All practices and scrimmages are open to the public and will be held on Morse Field at Alfond Stadium. Season membership renewals for the 2019 season are available now! Reserve your memberships at GoBlackBears.com or by calling 207.581.BEAR! March 30 10 a.m. - 12 p.m.
April 6 10 a.m. - 12 p.m. Sorry but I cringe when I see a slogan like that... just reeks of bad cliché. Last season NDSU had pretty much the same thing with "Dominate the Standard" and it just seemed silly to me. At last "elevate" makes a little more sense than "dominate". Well if the "standard" is winning a natty, then going 15-0 must be dominating?